30b30#20: Surprise someone | As I blog. My good friend Geta moved to London last weekend. Her and I both went to college at the same place and at the time, and then sat in neighboring cubes for months at Google before we actually met. At some point, we realized that we had a common connection to nutty operating systems professor at University of Illinois. The rest is history. Geta is one of these people that is just completely easy to be friends with: witty, generous, no drama, low maintenance, and often up for anything. Like a spontaneous trip to Ireland! She introduced me to Dav, and together, we've had many semi-impromptu San Francisco brunches in the past year, and they've done their best to expose me to the city life I'm missing as a resident of the dirty south (bay). 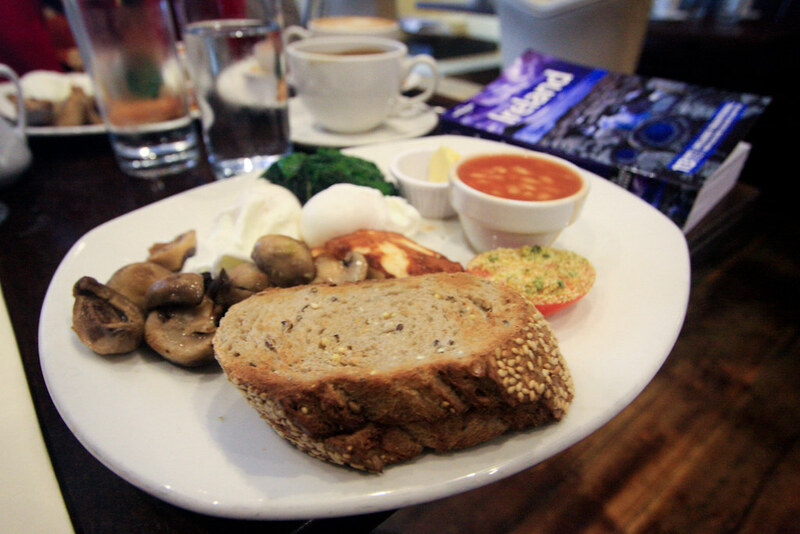 Yummy brunch in Dublin with Geta. One important thing to know about Geta is that she loves rainbows. The schizo-drizzly-foggy-sunny weather of San Francisco, something highly conducize to rainbow formation, was probably a large factor in her living in California as long as she did. She's the first to whip out a phone or camera to steal a picture of a rainbow, and catching an Irish rainbow was of primary importance on our trip. Come to think of it, the rainbows were probably the bigger pull than my company. 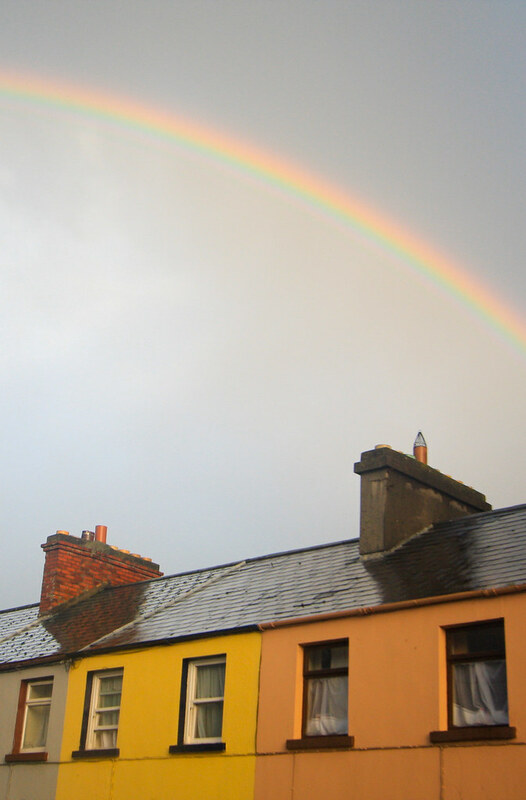 A rainbow Geta and I ran into in Galway. 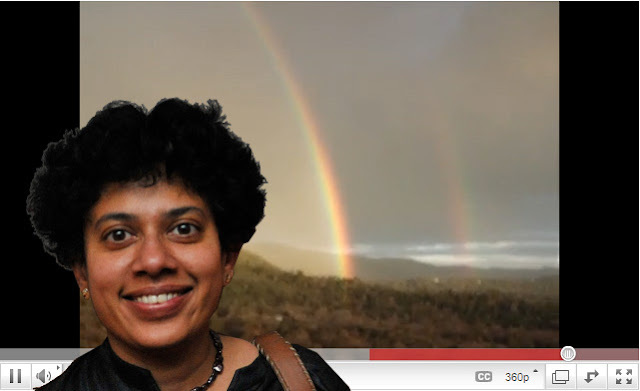 Geta and the double rainbow! Knowing she loves brunch, and loves rainbows, and I needed to surprise someone, the task seemed clear... a surprise rainbow brunch! 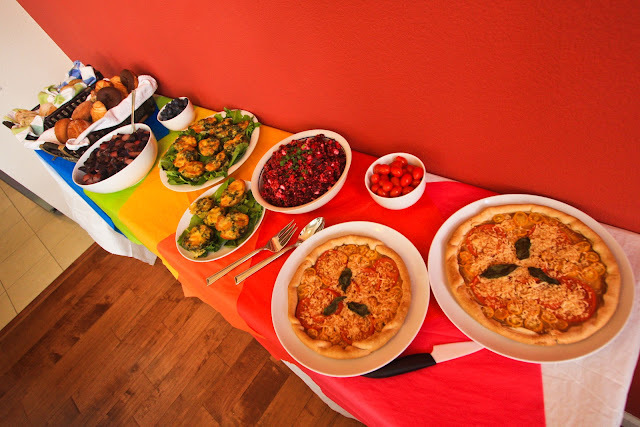 Dav took care of getting Geta to my condo under phony pretenses, and I took care of making a colorful spread. We told her that I needed help picking up a digital piano that I'd just bought from someone off of Craigslist. Bread with orange peach jam, purple potato salad, blueberries, green kale frittata, pink beet salad, and red tomato tarts! After that small moment of drama, we had a perfectly nice, low-key brunch. I'm positive that Geta would have appreciated a regular goodbye brunch just as much as this surprise one, so this was entirely selfishness on my part to knock of another 30b30 item, but I don't think she minded all that much. And now I need to go back and start looking for a piano - I really do want to buy one!